rec. 2008, Auditorium Landowski, CRR Paris. Billy Eidi, one of Timpani's paladins, has been steadfast in his practical championing of French music. He features on the label's songs of Fauré, Roussel and Satie. We have not as yet reviewed his CDs of Chausson, Honegger, Séverac and Delage but he has also recorded a selection of the solo piano music of Reynaldo Hahn. The first volume of the piano music of Guy Sacre was issued quite some time ago before Timpani changed the appearance of their sleeves. It comprises Chansons enfantines, Deuxième sérénade, Piccolissima-Sérénade, Variation sur une mazurka de Chopin and Vingt-quatre Préludes and was reviewed here. Eidi is the pianist in Timpani's two volumes of Sacre's mélodies: 1C1168 and 1C1233. The earliest work on the present disc dates from approaching forty years ago. Only the Thème varié is a single segment piece in one track. All the others are in multiple small movements; that's 42 tracks across six works. Everything is from the same stylistic homeland: a delectable vocabulary of atmospheric melody with the gentlest twists and swerves of subtle dissonance adding to a touching and chiming Gallic impressionism. The music is often pastel-shaded, pearly and liquid, somewhat akin to the manner of his brethren across the Channel, William Baines and Greville Cooke. You never doubt that this music is modern but its contemporary nature is often heard through a dreamy fairyland carillon. These are suites of miniatures but they are not simplistic. The ringing Animé with which Nouvelles Chansons enfantines opens is full of sparkling life. In Très modéré from the characteristically entitled Petits Exercices de la solitude there is a sphinx-like stare in the work's final notes. As is to be expected from a work with the title Soliloques introspection is the order of the day. Carnaval comprises twelve pieces of which tracks 34, 39 and 40 are 'Hommages' to Poulenc, Stravinsky and Ravel respectively. There is magic still to be discovered in tracks such as Dormeurs with its stark yet unfrightening forte high 'clink' ringing out above a lulling bed of sound. There's much the same sense in the slow-motion contemplations of Promeneurs - again from Carnaval. The superbly produced insert booklet for this disc has an extended essay by Robert Bared and is in both French and in an English translation by Mary Pardoe. We are told practically nothing about Sacre. A search of the internet produces only a few crumbs of information: a catalogue of twenty solo piano scores, three collections of Children's Songs and more than one hundred and twenty mélodies setting Verlaine, Apollinaire, Supervielle, Cocteau, Claudel, Schehade, Max Jacob and Jules Renard. Sacre has also written a reference book running to 3000 pages in which he surveys the piano repertoire ("La Musique de piano" (Robert Laffont, Bouquins collection, ). Those work titles are a faithful reflection of Sacre's imaginative and far fragile music. 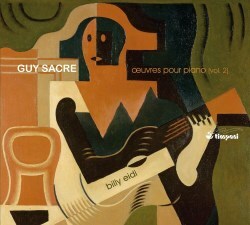 It is faithfully touched in by Billy Eidi, a pianist who seems to share Sacre's ideals.